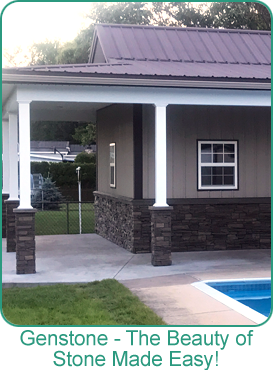 We designed the GenStone faux stone system to provide a true do-it-yourself friendly stone veneer home improvement product. Faux Stone has become the go to accent in creative home and commercial projects over the past decade and it continues to grow in popularity. Holbrook is the Northeast Distributor for Genstone panelized Faux Stone Veneer. Genstone - The Beauty of Stone Made Easy! "... We covered the concrete block foundation on the front wall of our house and the transformation is absolutely wonderful. Drilling into the concrete was challenging but the GenStone was otherwise not difficult to install and we were able to complete the project in one day. The Kenai complements our cedar siding well and we love the finished look."